And so it has me, just like the entire country. 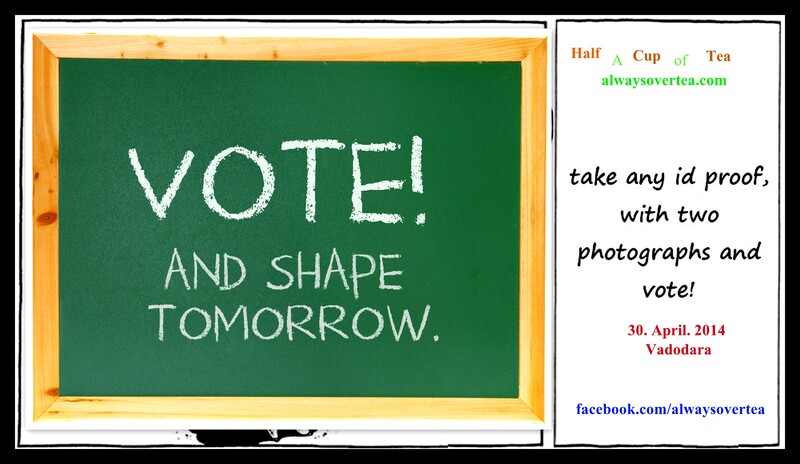 A Message from half A Cup of Tea – all you need is an ID Proof and 2 Photos to Vote ! Do that. It’s sunday morning, and I am just back from a long walk in the morning. The city is filled with hoardings and posters and various brands are endorsing “Voting” in the elections. There are of course the party hoardings of Congress and BJP and there are various corporate endorsing the act of ‘voting for your government’ via hoardings, creatives, initiatives, offering discounts and much more. I contemplate as I pick up my cup of tea. Over the last one month, Politics has absorbed me, too. I have read articles, journals, history, watched interviews, gotten into arguments and debates and analyzed events like never before. And anyone can easily say, that THIS is a movement. After a decade of scams and shams, the country now wants to look forward to a better tomorrow. I remember that time, when the corruption had reached its hilt and the ‘Anna Hazzare’ movement had ensued. The first time it happened, I went to too (I mean, I went only once, just to extend my support by watching. I generally keep a low profile from participating in anything that I am not completely aware of.) I think many of us youth had initially supported it. But then, the ‘dharna’ happened a second time. Then a third time and then a fourth and after that, I gave up. I watched as the country was walking aimlessly and blindly in support of that ray of hope,that promises to bring a better tomorrow. How many of the youth had read the Jan Lok Pal Bill? How many knew what they were standing for? Everyone walked blindly because they found a leader and they trusted him. I was scared. I had such great fear that I was living in a country where so many people would just get wooed so easily. I felt paranoid to think no one had strong opinions. All they knew was “they are against corruption”. That was 2011 – 2012. Do you remember the movement like I do? And I literally had to cry, that it’s only my skepticism and MORE to just encourage more educated fan following. I had to assert that I am against corruption too!!!! But it’s just that, I am a little skeptical when people can ‘use away’ so much of their time just stalling work. wouldn’t’ all that affect the growth of this country? You must also note: That while the whole ‘anti corruption’ movement ensued, the corruption levels around us went down. On a daily life basis, traffic police started to issue proper receipts, rickshaw drivers started to charge by meter and everyone talked about how it would be good to walk on the paths of ethics and doing what is right. Some benefits did come out of the movement. 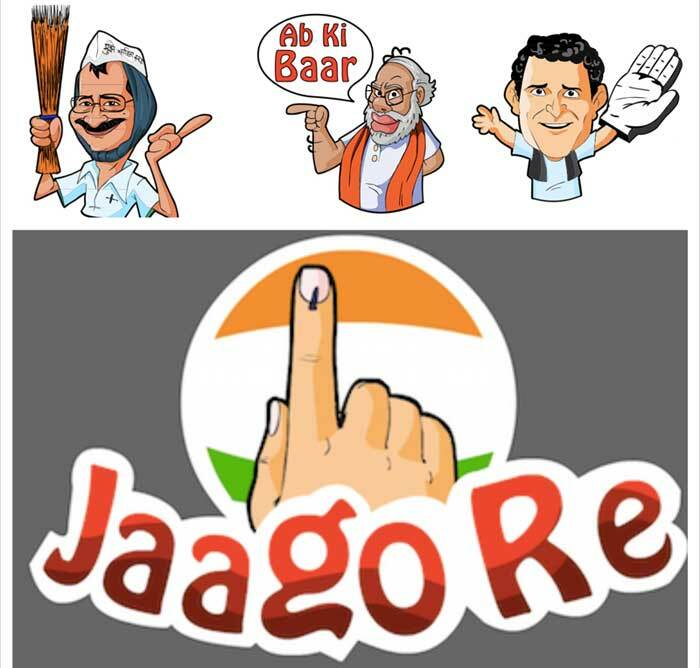 The Party was formed, AAP came into existence, and they formed the government in Delhi. and then Arvind Kejriwal resigned. “WHAT! !” I exclaimed watching the news. “He’s crazy! !” I thought and turned off the television. This was Feb, 2014. But by then, the world around me, had changed. History was about to repeat itself. The same blind following and the same extreme “Mera Bharat” chauvinism had returned. But this time, it wasn’t AAP. It was BJP. This time, the patriotism is for Narendra Modi. This time, you can’t say a word against him because if you do- you will be ostracized. And honestly speaking, I have experienced SO MANY PERSONAL attacks for just raising a few questions, that I totally refrain from talking about my political inclinations. Yes, this is the city where Narendra Modi stands from. Yes, Vadodara is all this alive mostly in support of him. But, why is this ‘choice’ putting us all against each other? The events of the past few weeks have finally pushed me to the brink, to speak up. The first thing is, to NOT judge colleagues and friends based on who they are voting for. It is our right to make a choice. We all want the same things – development, peace, prosperity, harmony and success. The Second thing, I see the same blind movement that happened in 2011. I see the blind following for Bharat Janta Party just because we’re all tired of the corruption around us and we’re tired of seeing a failed government with Congress. But is it fair to make the same mistake again? To walk blindly in support and not make a well – read choice? And let me reinforce here, that reading does not mean reading only the posts shared by your friends on facebook. Reading means, researching and finding your own answers. It is fair if you have read – if not everything, but attempted to learn about your party. It is important, to make an educated vote. Educate yourself first and then vote. Read. Ask questions. Find your answers and then vote. And if you are going to vote only because it’s “your right” or only because it’s such a big deal to vote this time around, then the fact and the truth of the matter is – that your vote is equally biased as anyone who casts a fake vote. Your vote is a fake vote. Now coming to the third part of my discussion. 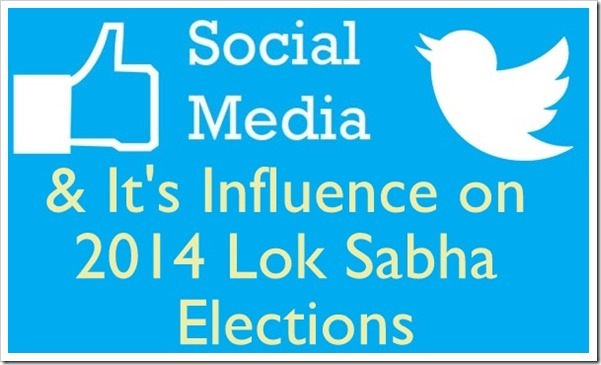 I have an issue with the way the elections are being promoted and the way the parties are branding themselves. With campaigns that run into a good thousands of crores, where does this money actually come from? Billboards, radio and TV ads shout slogans so much more than actual people. But while we see so much of it around us, it feels like there’s a wave. I quite suspect it now; to be more of what is projected and purchased, than a real moment that garners support and strength with each passing moment. That, I suspect is happening. And I wonder. Is that what this election has become about? Almost feels like an Indian Idol contest where the most entertaining candidate wins. Maybe I am just being too critical, but the fanaticism is evident. I may not get there, but there are a few links I would like to share form my expedition to find my answers. These have helped me form opinions or look for answers. 1. CNN IBN Sagarika Ghosh on Special series “Open Mike” from Sabarmati river front, Ahemedabad. 3. Arvind Kejriwal in an interview “google hangout” with Rajdeep Sardesai. 4. The events of the day when Arvind Kejriwal Resigned as CM. Reading this – from below to top, will sort – of – explain why he resigned. And then the media did it’s job of calling him “Bhagoda”, a person who runs away; but going by the things I have read now, make me feel otherwise. 5. Have you heard how the parties have been canvassing this time? Somewhere down the line “personal agendas” are mixed with – wining the seat for the party – agenda. And also, “personal attacks” are rampant. The BJP will abuse Congress and the Congress will Retaliate. Then someone will make a joke and some news channel will debate about it. It’s endless. But amongst all this, we have AAP. Yes, Kejriwal might be making statements about Ambanis and congress and BJP and black money and everything. But have you seen the social media pages? have you seen the content they share? No abuse. They are speaking the right things. He makes statements like “We will remove people who have a criminal record form our party (if they have hidden facts and joined us) and cancel their tickets”. He makes statements like “We’re willing to grow”, he makes statements about “Not being corrupt” and being a “common man” and somehow I tilt towards believing they have their heart in the right place. They just made a few mistakes, simply coz they aren’t really politicians (my school of thought!) I know they won’t win this time, but I do hope that a party like that survives and grows through time! And finally, a debate – discussion can’t end without mentioning this man. “if you don’t oppose what’s wrong, you’re actually backing it. “ he says.I can’t remember which Arnab Goswami News Hour it was where he made this statement. Here’s one interview which discusses Togadia. “Do not divide this nation while you try to justify (BJP) Ms. Negi” he says and makes a point. And those are my fears. With the way Rahul Gandhi has failed to talk any sense on the TV interview, “Secular” and “Woman empowerment” have become abused words. He dodged questions, he was stupid, he was unconfident and he was not well prepared. … Is that our fault? Secularism and Security for women are concerns that need to be taken up with greatest reverence. One of my greatest fears is divide based on religion and moral policing for women. One of my greatest fears is education, security for underprivileged and social development will take a back seat. One of my greatest fear is, what are the children of the country going to grow up learning? Extremist views and propaganda? That’s not what I learnt as a kid and I feel so strongly for it, because that’s what my pride was, as a child. The secular and free spirit that my country gave me; I pride it and always will. I hope we never trade that off. I want to believe that thought. So yes, what I am going to say now, is Bring it on! I am ready to see Narendra Modi as Prime Minister. Let’s see him bring the development. “How soon he will do it and at what cost, is what we need to see.” said a friend on a facebook status this morning. “And if things go wrong, we can expect the media and our own energies to be invested in re-defining the government yet again” if the need be, we shall do that too! Please do not divide this society/friendships and people based on opinions and choices they make. Please don’t be fanatic. Please don’t attack someone just because they have a different school of thought. BJP will win. Modi will come to power. Let everyone reap and enjoy the benefits when they happen and let everyone stand together if things go wrong. Let’s just vow – that when we go out and vote – we will pledge not to point fingers and not to divide over differences. Amen. “can we make that blind following for a second time ?” ANNA’s movement was deemed as “the love for country” but many ppl had their political wishes hidden ! IN 2014 , we all know that theres a political party who’s PM candidate is a proved tactian and a A grade politician ! n hence ppl are following ! so the point about blindly following is purely judgemental ! not saying we’ll vitness extreme development or anything but , ppls Belief of growing under a certain man is damn true ! thats wat joins us ! a dialouge in RDB ” Jo Log Uncha sunte hai , Unhe Dhamaake ki zarurat hoti hai” ppl are smart n they’ll hit back !! As for the “Hidden Political agenda”, that’s what I was skeptical about when I raised questions then. I agree. But gradually, I realized that’s not quite true. The political ‘agenda’ is not as fierce as for other parties. Check out the links I have shared. The run- up to Arvind Kejriwal’s Resignation. They know he’s an “A Grade” politician – but have you really done your research? What do you know of his development works? The industries in Vadodara? Education and poverty ratios? What about the growth rate of the state before his rule and after his rule? Do you know all those stats? If you know it and you follow, then it’s okay. If you don’t know it and you’re going by what you are hearing via branding then you are following blindly. Depends which category you are in. I know that a majority are in the former. It feels negative? Not intended. It’s intended to urge people to Think. And turning a blind eye and over looking the negatives, doesn’t make things good. It’s liek the ostrich. Puts it’s head in sand to run away from danger. Danger doesn’t go away if the ostrich puts it’s head in the sand! it just can’t see it. In the analysis of nitty-gritty, we often tend to ignore the simple explanation. The majority of Indian population is young; almost 1/5th of working population live in India. These people are crying out for jobs and economic opportunities. They have become more and more aspirational; freebies cut no ice any long. A few percent of change in growth means creation or loss of millions of jobs. So yes, growth is THAT important! Modi, arguably with his abilities, has occupied this political vacuum as a man who can deliver. In this situation, everything else is SECONDARY.